Home » Have Your Say » Sikyong 2016 — Who has your vote? Sikyong 2016 — Who has your vote? In one month’s time, it will be clear if the incumbent Sikyong Lobsang Sangay is re-elected, or Penpa Tsering will surprise us. The two are the final candidates for the post of Sikyong 2016. For the final round of voting in the Tibetan General Election 2016 on 20 March, Sangay being the incumbent has the upper hand, but Penpa Tsering’s challenge will provide tough competition. The voting results will start to trickle in the day after the election, and after a few days we will know the winner. Tibet Sun will update with the results as in the preliminary round. Sangay led the preliminary round of voting in October by a huge margin, but since then he has been dogged by a few accusations. The most serious concern has been his request for a Kalachakra ceremony to be held right before the 2016 election. This was seen as very self-serving, since in his current position as Sikyong he would be required to attend alongside the Dalai Lama, and his presence at this great teaching and empowerment would provide him with an unfair level of visibility right ahead of the election. The Kalachakra 2016 has now been postponed until January 2017, and the postponement has caused much debate in Tibetan society and worry for Sangay, with this image of being selfish working against him now. He has vehemently denied any wrongdoing whatsoever. Another serious accusation is that he removed a portrait of the Dalai Lama in the Office of Tibet in Washington DC and put his own portrait in its place. Despite his repeated clarifications that this was never done, the issue has become one of the serious campaign spoilers for him. The uproar about the source of money to purchase his house in Boston with a lump sum payment has been discussed before. But it has since died down perhaps due to clear and proper explanation that his instalments for the purchase of the house from his Harvard salary ended after his decision to join the Kalon Tripa race, and that he had paid the remaining mortgage from the savings of himself and his wife. His supporters say Sangay should be given one more five-year term so that Tibetans could benefit from the experience he has gained in the last five years. Also he would then be able to complete the projects and programmes that he had initiated. Penpa Tsering contends that he would provide better governance given his twenty years of experience in CTA as a member of Parliament, including two terms as a Speaker. He is particularly banking on his election victory in the Gangkyi area, the capital of the Tibetan Diaspora [seat of the CTA], in the preliminary round, saying that CTA staff members would be the best judges of himself and Sangay. Penpa Tsering also won from Washington DC, the capital of the United States, where most of the Tibetan voters work in the Tibetan-language sections of the US government-funded media houses Radio Free Asia and the Voice of America. He has been arguing that people in these two places have better knowledge of Tibetan politics. Those who are against Penpa Tsering have accused him of killing a former lama, whose wife he later lived with for a few years. He has denied the charge and has challenged anyone to prove him guilty. The main responsibilities of the post of Sikyong are to work for a free Tibet and for the welfare of the Tibetans in exile. Who do you think would make a better Sikyong? 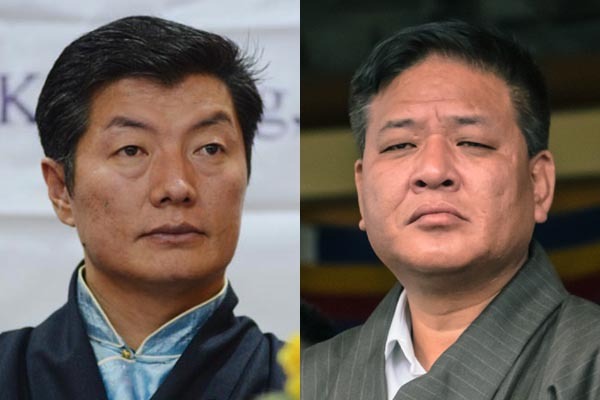 Who has your vote — Lobsang Sangay or Penpa Tsering, and why? I don’t agree with almost all your accusations against the incumbent Sikyong. Those are all baseless and overplayed to confuse and change people’s support for him. He will proudly win this election too despite all the dirty campaigning by the supporters. He will continue to shine in India and abroad for Tibet and Tibetans suffering under Chinese rule. He has still the full and clear blessing and appreciation from His Holiness. All the accusations will fade away like the cloud in the space. I also feel he deserves the next term to continue and fulfil some of his policies and plans. I agree with Mr Tenzin lak (Toronto) — our Sikyong Dr Lobsang Sangay lak has still the full and clear blessing and appreciation from His Holiness. All the accusations will fade away like the cloud in the space, and shine like the Sun after last night’s debate. He was the people Sikyong, not dependent to other Keidhuk or Choka. I also feel he deserves the next term to continue and fulfill some of his policies and plans. Sikyong must release his 10 years’ US Tax Returns to the public to prove that indeed he did not receive money from suspicious sources to pay off his housing mortgage in Boston, USA, prior to beginning his Sikyong term. This is a very serious issue that needs to be looked at. Why show tax return. There is no need of such papers from USA for a Tibetan election. Nonetheless, tax returns necessary do not show all incomes, apart from the taxable incomes. So, what is the purpose. Its only a game without any substance. He is not at all that desperate to take couple of hundred thousand dollars to pay for his mortgage. It is an unnecessary issue created. We are grateful to these candidates who served our institution for several years. I salute them for their courage and determination to continue. Given my personal choice, I would prefer Mr. Penpa Tsering as next Sikyong because I believe his effort will not go in vain on matters relating to Sino-Tibet dialogue and valued and healthy performance on Tibetan Education Policy. In 2011 I voted for Lobsang Sangay. I voted because of his credentials — a big degree, international exposure, good connection with Chinese scholars and youthful energy. But to my disappointment, he failed to bring anything concrete. No change, no China dialogue and all his big dialogues proved nothing. He came on three big slogans — Unity, Innovation and Self -sufficient. Nothing came out of these and his works didn’t have anything to do with these qualities. There’s more division in the society now than before, there wasn’t any innovation and with regard to self-sufficient, he now boasts of how much aid money he was able to bring from the US. It’s totally contradicting his own philosophy. The big talk about bring His Holiness the Dalai Lama back to Tibet came out to nothing. Not even a single China-Tibet dialogue could take place. It’s all because of his false hope that many Tibetans (almost 150 as of now) set themselves on fire thinking that something good will come out of their sacrifice for Tibet. Sangay must take responsibility of all these violent suicides. I don’t want to see Tibet and Tibetans waste another five years. So my vote is for Penpa Tsering. He may not have a big degree, but he has a proven track record of service and success. Dear countrymen, let’s shun the useless regionalism attitude and vote for the right candidate Penpa Tsering, if you think of Tibet and Tibetans. Bhod Gyallo! Who is controlling Sikyong from South? Both candidates should explain and clarify the lingering doubts in people’s minds. I fully agree with notion of having “No confidence motion” in our constitution, as we need laws to deal with people adopting unconstitutional practices and means to benefit certain section of people or individual related to those in power. SiKyong la, you owe us an explanation. I am really confused. So much mudslinging and blame games. People need to check thoroughly and decide who to vote in the finals. Once you vote, then you can’t undo for 5 years. Its not there in our Chatrim. May be we should think about it in future. Right to No confidence Motion in the Parliament, provided our MPs have the guts and sincerity to do that. One curious thing that my friends propose and people talk of, is the RTR-Right to Reject, during the Votings. Why do we need to vote when we are not satisfied with any candidates on the List. If the majority of the voters are Stupid and Partisan, while play along. Why we too have to be Morons. We can at least keep our pride and sanity intact by not voting or Rejecting the Candidates. Then only the power of Swaying Voters with Money and Expensive Campaign can be neutralized. Yes, One thing that the current Sikyong is guilty of here in my settlement is that He has been used by local goons and it is said, whether true or baseless rumours, that Sikyong and Gyari Dolma is Controlled from Bylakuppe and that many illegal Things were carried on due to that Pressure. That Sikyong has no power to Reject their Demands. That’s seriously Pathetic. People must stop this manipulation during the Elections. If a Sikyong is that Weak, what can we expect from him. So guys This must be Stopped. If Sikyong wins again, he must stop this nonsense. Lets Pray for Tibet. May Tibet comes out Victorious this time too. Who is in Bylakuppe with such power to control sikyong? Please let me know. [[ Hi Tenzin, sorry i couldn’t publish this one — you have some good points here. Please check the Comment Guidelines for policies regarding comment length, ALL CAPS, and “be nice”. Rewrite and send your comment again so we can publish! There are really some confusions and doubts regarding both candidates and I think it is morally good for them to clarify their position and tell us what is the truth behind all these charges. People have right to know about their personal dealings and other matters that may have direct or indirect connection to Tibetan people. Nobody should ever use or misuse the name of His Holiness and bring disrespect to his office as it is the only institution revered by people from the core of heart. Both candidates for Sikyong should come clean before the voting takes place and playing dirty politics to defame any person is immoral and not good for the Tibetan cause. Let them explain to people who is Mr Clean. They owe us this explanation seriously. Lobsang Sangay has been an enigma from the beginning, starting with the confusion of his name. He uses Senge — “lion” — in Tibetan, but “Sangay” in English — “enlightened one” — which seems to feed a big ego. I heard that he didn’t pass his Tibetan test when applying for the Fulbright scholarship, but that Dr Tenzin Chodak of Tibet Fund, a phayul chickpa [from the same region], helped him. He was also allowed not to return to serve after finishing his studies, on the pretext of holding talks with Chinese students. During the campaign in 2011, he lamented that both Tenzin Tethong and Tashi Wangdi were old and should step down — a really rude and disrespectful thing to say by any standards, leave alone Tibetan. At that time, no one noticed it because he was wearing the cloak of new generation and change. Now his personality is showing more. Recently he was caught in a video saying that the older generation who worked for Depa Shung [Tibetan government] were at fault. There was a mess of LS and Pema Chinjor singlehandedly deciding not to allow the Dhasa Chugang to offer tenshug [long life puja] at Kalachakra, and Delhi Chugang being informed and coming to Dhasa to show off. HH became aware of it and decided to postpone Kalachakra. Dongchung Ngodup was deliberately not called for the meeting even though he was part of the organizing committee. LS is usually very scornful of Tibetan media and looks down on any Tibetan enterprise. He had a hand in the ouster of Jigme Ngapo and Jamyang Norbu from RFA. The biggest scandal which the Tibetan people, even Lobsang Wangyal, don’t know about, is the ouster of Gyari Rinpoche. LS apparently played a wild trick to get rid of him. He allowed a foreign ex-president to have audience with His Holiness. That ex-president was apparently saying that he gave a million euro to Gyari Rinpoche to be given to HH. Now HH and Gyari Rinpoche don’t meet. This is all the fault of LS. It was learnt later that Samdong Rinpoche had written a letter to say that the money received by Gyari Rinpoche was spent by CTA for various community projects. HH came to know about it, and since then hasn’t praised LS publicly. LS with his adviser Pema Chinjor, belonging to the Delhi Chugang faction, has been sowing intrigues in Dharamshala instead of working for Tibet and the Tibetan people. He has given HH more reasons to be worried and tired than before. Now he is using HH and Nechung names to get votes. Shameful. Thank you so much for enlightening us on those issues. I have never been a fan of Lobsang Sangay but from your above observations i finally can see that Lobsang Sangay despite his narcissism and being an irritating ego maniac, he is doing the right thing. Kudos to him! Riding high on the division in our community at the time, Lobsang Sangay was propped up by the new Chugang in Dharmshala to crush the real Chugang in Delhi. It is because of the role he played in that, that he was awarded with the Fulbright by the Kashag at that time. Please ask Samdong Rimpoche, Tenzin Tethong and others in the Kashag of the time. Now a handful of remnants of the new Chugang find themselves out of importance and of no service and all this shenanigans. What purpose do they serve? Just move on! And shame on you for blaming Lobsang Sangay for the ouster of Ngabo Jigme and shunning of Jamyang Norbu from RFA. People have followed the RFA saga of Ngabo’s ouster and can decipher why and how it happened. don’t think you can fool us. As for the “biggest scandal” that you mention about Gyari Rimpoche’s ouster, it is indeed a big scandal to not account for that huge amount of money. Samdong Rimpoche verbally assuring that the money has been spent in various projects is not good enough. A lot of the people know how at least a part of it was spent on. To fight, threaten and terrorize the Old Chugang into submission. Is that what the money was donated for? At least one thing Sikyong is doing right and making amends. Your biases are so deeply entrenched that you will never recognize it. There should be public debate between the two prospective candidates for Sikyong in the coming election, in the presence of eminent writers, academicians,journalist, political observers, experts, and general public. It is the right of every voter to find out who is the better candidate to take this big responsibility. Can we create a post of Deputy Sikyong? Both are good candidates but we want the best to lead us in the right direction. The security of His Holiness is our first priority and there should not be any compromise on this issue. It is the duty of the exile government to work with Indian officials and take full proof security measures to protect him. I am surprised how a lady could break security cordon and attempt to assault him. The Sikyong should explain his position on Dolgyal and tell us more about it. In two months a new Sikyong or the head of the CTA will be elected whose job will be to implement the vision of His Holiness the Dalai Lama and to lead the Tibetan struggle towards a negotiated settlement with China. Five years back Kundun was 75 years old, and the current Sikyong (now seeking to be re-elected for a second time) was elected with much fanfare and hope. It is true that the Tibetan issue is both complex and complicated, and a solution is not easy to find. At the same time, administration is a professional subject not taught in school or college, therefore, in India, we have Indian administrative services and institutions. To give the responsibility to lead an exile administration to a fresh graduate from a college, however prestigious it may be, is expecting too much from him. Therefore so many questions are asked which he is finding difficult to answer. However, I am not going to discuss any of them. One prominent issue that is quite worrying in these five years is the increased activity of the Dolgyal cult. These days, wherever Kundun visits in the west, anti-Dalai Lama Dolgyal protesters have become a common feature. At one point a lady almost physically hit Kundun, breaking through the security cordons. This was not a small issue and it was raised in the Tibetan Parliament — but instead of Kashag taking action on the person responsible for the security lapses, Sikyong defended and covered up the case which raised more questions. Many years back, the representative of His Holiness in Delhi, Tsering Wangyal la, made the simple mistake of getting a wrong date for His Holiness’s flight, and so His Holiness’ departure was delayed. For this security lapse, the Kashag immediately took action and removed him. Today, there is, it seems, less concern to the security of Kundun. In another five years he will be 85 years old and such lapses, if continued, will lead to a big historic disaster. I don’t like to accuse the current Sikyong of direct support to Dolgyal, but three things really concern us all. 1. Kashag’s removal of certain information from Tibet net, immediately after Sangay became Sikyong and making Kaydor handle it instead of DIIR, which got huge praise from Dolgyal followers. 2. A recent letter from Dolgyal office, Delhi, to New York which says that we much help each other and to pretend to protest against him to help calm the public. 3. In their website, which I opened for the purpose of research only this morning, they have targeted Kundun, Samdhong Rinpoche and Tsoktso Penpa Tsering. Not a single negative word against the current Sikyong, which indicates his softness towards the issue. This issue concerning the threat to the life of Kundun is a great concern not only to Tibetans but also millions of His Holiness’s followers in the Himalayan region as well as within Tibet. If the immediate person next to Kundun is soft against an issue for which Kundun feels is a reason for disharmony amongst the various schools of Tibetan Buddhism, he will not feel comfortable. As a patriotic Tibetan dedicated to the service of Kundun, the current Sikyong, on moral grounds should step down gracefully and support Tsoktso Penpa Tsering and work towards clearing the doubt. Tsoktso Penpa Tsering has 20 years of experience with a proven record. If the intention of the current Sikyong is to sincerely use his education for the services of the community, he can continue to serve as the struggle is still continuing. Tibetans were once brothers and sisters no matter what school. Perhaps for the past 20 years when we have all been fighting with each other we missed the Free Tibet dream vanish, and our politicians become more corrupt and self-serving. All Tibetans need to reach out to the international community, halt round two of the election, and lobby for an actual democratic vote. Once His Holiness passes away no one will care about us anyway. While I share your concern about His Holiness’ safety and security, I disagree with the notion that all Shugden followers are hostile towards His Holiness and join the bandwagon of New Kadampa Tradition (NKT) radical group to discredit and protest whenever His Holiness visits the West. There are many common Tibetans who go on with their lives and contribute to society, but continue to practice underground and believe in the spiritual aspect of this religious school of Gelugpa. But they are shunned by the community, and many face systemic discrimination on the basis of official directives in Dharamshala. This is not to deny that there are some groups among Shugden followers who sought skilfully with Beijing to harness each other for their respective power games and financial gain. We need to differentiate between them, and stop demonizing all as devil with two horns. The incumbent Sikyong Lobsang Sangay has taken a series of ground-breaking changes by uplifting socio-economic growth and development in our community. He also strengthened the dynamic of Tibetan diplomacy on many issues, personally when he visits abroad he establishes his visibility in the eyes of both the leaders and people of those countries. His ironic determination, farsighted vision, staunch support of His Holiness, and priority given to Tibet issues undoubtedly which enable me to vote him again this time. Kalachakra postponement and removal of His Holiness portrait are both non-issues. What’s the big deal even if he replaced with his own picture, as we know that there are plenty of portraits of His Holiness displayed throughout the office of Tibet in DC but not that particular spot. The real issues people should be outraged about is an obstruction of fair and democratic election influenced by the establishment in Dharamshala, including these two candidates to the Election Commission, by implementing arbitrary last-minute rules. Also the candidate refusal to share platform to discuss and debate the policies. The Tyranny of the Majority. I believe that Penpa Tsering messed up his campaign trail big time by his comment, be it ignorant or deliberate.